I've said before that I have so many Batman figures, it takes something special to get me to buy a new one, whether it's unusual colors or a new design. That means I've passed on some otherwise good toys, like Greg Capullo Batman or Zero Year Batman. But I did finally get one Capullo-designed figure, in the form of Thrasher Suit Batman. The suit is built for war. It's made of meta-aramid fibers of Batman's own design, tougher than Kevlar. Made to withstand burning heat and freezing cold - temperatures as low as the Arctic winter. It uses a semi-solid flow micro battery. It has enough oxygen for weeks. It's built for battle in the most inhospitable territories on Earth. And he ended up wearing it in his own home. 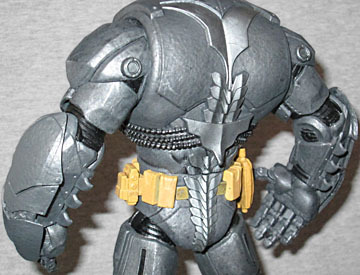 The Thrasher Suit (which is a name made up for the toy - it was originally just called "battle armor") made its first appearance in the "Night of the Owls" storyline: when the Court of Owls sent a group of Talons to attack Gotham City's most prominent citizens, Bruce donned this suit to face them. It's a lot more "Iron Man" than "Batman," but still has a Gotham City flavor. The suit is entirely grey metal, with a large black bat symbol on the chest. Ridiculously, it also features a yellow utility belt. Really? How does that work? The suit's fingers aren't small or dextrous enough to reach into pockets, so what possible purpose does the belt serve? Apparently Bruce installed it just for branding purposes, no different than the pointed ears on top of the helmet. Actually, as long as we're talking Iron Man, this armor is more Hulkbuster than Extremis - it's big and bulky, like armor would be in the real world, not skin-tight tin foil. The helmet-ears break the 9" mark, and if you remove said helmet, you'll see a tiny Bruce Wayne head underneath. The face looks rather sickly - like many recent DC Direct figures, it's cast in color, but the plastic chosen is pale and sallow. His cheeks are sunken, and his eyes are outlined with dark paint. To be fair, however, that matches how he looked in the comics. Bruce had recently been through an ordeal, and was recuperating at home when the Talons attacked. Really, he should have a few days' stubble, but otherwise, this design is on-target. The same goes for the rest of the body. The sculpt is credited to both Jay Kushwara and Jonathan Matthews, so we don't know who did what, but it all comes together very well. We will say, however, that Kushwara has beaucoup experience sculpting armored characters, so maybe he did the body and Matthews did the head? Just a guess. 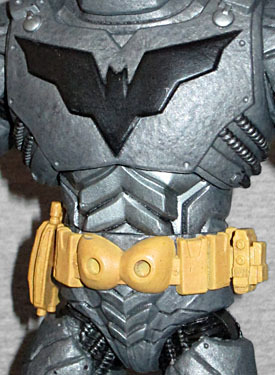 Some of the details seen in the comic have been changed (for instance, putting little bat-ears on the kneepads, rather than having bat-shapes on the kneepads, or moving the device that used to be attached to his right thigh up onto the utility belt), but they're all minor things. 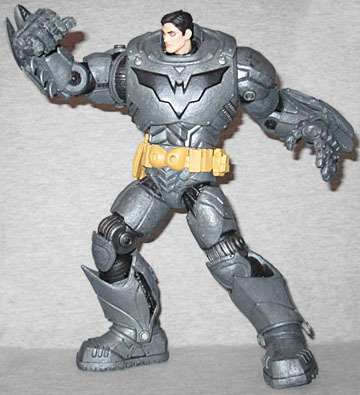 If you look at the underside of his forearms, you'll see three spikes, just like Batman usually has on his gloves; in the comic, those popped out of the arm, and then could be fired like batarangs; here they're just sculpted in place, but you won't really care. He just looks too cool. Where this figure really shines, however, is the articulation. Yes, articulation. On a DC Direct toy. And we're praising it, not complaining about it. What a world! 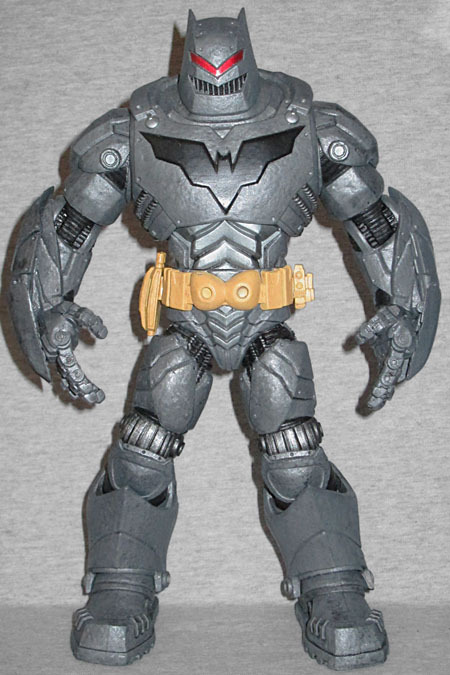 Thrasher Suit Batman moves at the balljointed ankles, swivel shins, double-hinged knees, swivel thighs, swivel/hinge hips, swivel waist, balljointed torso, balljointed head, swivel/hinge shoulders, swivel biceps, hinged elbows, and swivel/hinge wrists. And then there are the fingers. Each finger has a hinge joint where it joins the hand. Then another hinge at the proximal joint. Then another joint at the distal joint. 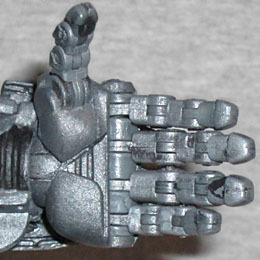 And two three more hinges in each thumb! That is FIFTEEN joints in each hand! We haven't seen anything like this since ToyBiz's Spider-Hulk in 2006, and that had six fewer joints per hand than Batman does. One of the thumb joints snapped and had to be glued, and getting his waist moving required a pair of pliers (you can still see the tooth marks on the belt where they scraped it), but all together, the figure has 59 individual joints. Holy crap, what a toy! I ordered this figure because it fit my criteria of "don't look like every other Batman," and it turned out great. Even if you think Bruce's face looks weird, leave the helmet on and pretend this is just an automated Batbot, rather than a suit of armor. Get this toy, and then get the story that it's based on, because that's terrific, too.